Here he is, making all the ladies swoon. Sidenote: My kind-of-friend, who is lead singer of the band Book on Tape Worm, looks like this guy. Over the past week or so, I have been annoying everyone I work and hang out with by playing this tasty tune for them at random times. It took over my life. I was addicted. I started to dig deeper and deeper to see who else had done covers of this song in order to feed the beast that was growing within me. I started to realize something. Something horrible. I had missed a meme. For married couples, this is the same feeling you get when you miss your anniversary. Or for parents, a child’s birthday; for students, a final exam; for a professional football player, the Super Bowl; for single women, a chance to complain about being single (ehh, jk). 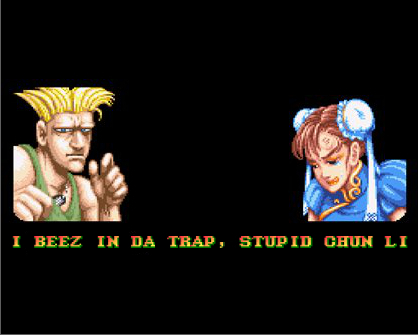 Apparently, there was a meme in 2010 that dealt with the fact that Guile’s theme song goes with everything. For example, Major Guile’s theme song goes with a video of a man finding out he is unfortunately not the father of a certain child. You liked that, huh. I knew you would. Anywho, I kinda got sidetracked. This really isn’t about a missed meme (even though it was pretty amazing). This post isn’t about Street Fighter and how awesome it is (You don’t think it is awesome? Well, you probably also thought sports had the greatest comebacks ever. You’re wrong, both times. Check this vid out. On the brink of death, this dude blocks all of Chun-Li’s lightning kicks and then goes HAM. Amazing!). It’s not about how inspiring of a speech Jean Claude Van Damme gave while accurately portraying Major Guile on film (They call him Colonel Guile in the movie, but don’t let that ruin it for you). It’s also known as “Rush of the Wind”. There are literally drum solos for everything, so it’s not that impressive that there is one for Guile’s theme song. But, as YouTube user KingofKingz819 put it, “he played the [expletive] out of those drums….for America.” I agree, KingofKingz819, as per usual. This chick, Lara De Wit, plays a bunch of video game themes on various instruments (Violin and Piano). I see this as pandering to gamers who objectify gamer girls (lame), but to each their own, or something stupid like that. Anyway, she doesn’t have Premontory in her repertoire (as far as I can tell), so she isn’t that cool. This YouTube user, MrSolidSnake745, has multiple floppy drives play different tunes by making the drives move back and forth. Some of his work includes, but is not limited to What Is Love, the Imperial March, the USSR Anthem, and the Beverly Hills Cop theme. But this Guile theme is unbelievable. How does one even think to do this? I don’t know, but currently my roommates are surfing Imgur, watching Adventure Time, playing Fable 2 and drinking YooHoo. That might have something to do with it. This isn’t the original video that I posted (the original is soo good. So good, in fact, you might even say he’s a specter from the gods). Anyway, this version is so crappy that I don’t know if he is accidentally sucking or if he is intentionally trying to be horrible. Most commenters sarcastically make fun of him, which kind of makes me feel bad. For example, in this video he made, a YouTube user says, “what the [expletive] is this angel doing on earth? its supposed to be in heaven singing. Thank you for this gift.” The poster of the video and angelic genius, TheSegacampGamer, replied with this, “but being here on Earth is even Better :D”. I don’t know if he knows that heaven is better than earth, but we are grateful to have him, regardless. It’s more like 1.5 arms, but let’s not split hairs over this. The most important part is that he is at a considerable disadvantage. More so than, let’s say, Flea (here is Flea in easily the greatest on stage costume that the Letterman show has ever seen). Playing songs with one arm is one of the music industry’s favorite past times, so we like it, but aren’t necessarily awed by it. I mean, look at these guys–dancing and gyrating to the cheers of the crowd. This is normal now. It’s so beautiful. Watch his hair shake. Just watch it. Uh, I got distracted for a moment. Oh yeah, one-handed base player. He’s good, loves his country, and respects Major Guile. Street Fighter isn’t just a game that you played on your Sega Genesis or Super Nintendo when you were younger. It isn’t just an awesome movie starring Dirt Claude Van Damme. It is a cultural phenomenon that continues to inspire and lift all those that experience it. Peace and blessings and SONIC BOOM!